With the World Cup in South Africa looming and all of Europe’s major nations readying themselves for the competition, new analysis by sportingintelligence of the domestic seasons just ended shows that Germany’s top division attracted more fans overall than England’s top division for the first time in history. It has been established for some years that the top division in the 18-team Bundesliga has the biggest average domestic football crowds in the world game, ahead of the 20-team English Premier League in second place. The respective averages per game in the season just finished were 42,499 fans per game in the German elite division and 34,158 per game in the Premier League, according to our calculations. 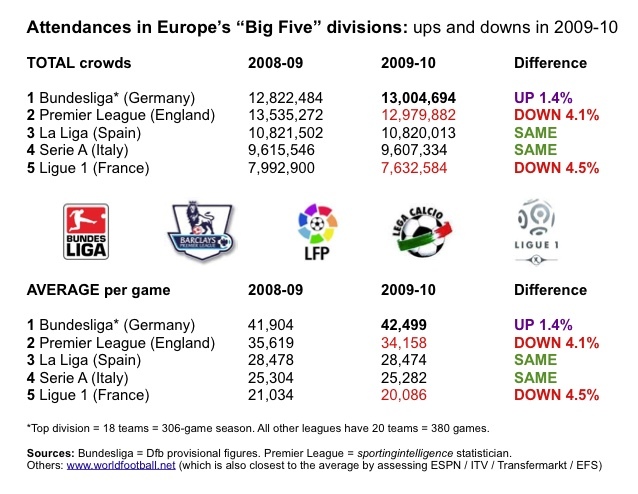 Yet remarkably, despite the Bundesliga league season consisting of only 306 matches against the Premier League’s 380 matches, the Bundesliga in the 2009-10 season – for the first time – overtook the Premier League in total crowd numbers too. According to our figures, the Bundesliga nudged above 13m for the first time (13,004,694) while the Premier League dipped below 13m, to 12.98m paying fans. This was the first season since 2005-06 that the Premier League dipped below 13m fans, and it was mainly down to Newcastle United’s absence. The Bundesliga began in 1963-64, and never before in its 46-year history has Germany’s top division attracted more fans in total than England’s top division, until now. The steady rise in numbers watching top-flight football in Germany can be seen at the Bundesliga website. Data for 2009-10 has yet to be added there. The year-on-year decline in the Premier League can partly be assumed to be down to the recession but probably more attributable to the absence in 2009-10 of Newcastle, whose massive crowds will probably take Premier League averages back up again next season, almost certainly towards the 13.5m levels seen in 2008-09. Why should we expect this to be true? Because Burnley, Hull and Portsmouth are leaving the Premier League, and they contributed around 63,000 fans per home game combined, or 1.2m fans from all their home games combined in 2009-10. Meanwhile Newcastle, West Brom and Blackpool are coming up for 2010-11, and will bring about 90,000 fans per home game combined, or 1.7m over the whole of next season. Automatically, therefore, the Premier League should get a 500,000-fan boost simply down to the make-up of the teams next season. As our table below shows, the Bundesliga registered year-on-year growth in fan numbers of 1.4 per cent, and was the only “big five” division to do so. The Premier League registered a fall of 4.1 per cent, with the top division in France faring even worse, with a fall of 4.5 per cent. In Spain and Italy, there were tiny falls year-on-year, respectively by four fans per game and 22 fans per game, which is statistically insignificant. Collating this information is not as simple as it might seem because the individual leagues do not necessarily all release official figures. Where we can, we use official data. For the Premier League, we use the services of our brilliant in-house statistician, Brian Sears. His figures are a few fans per game higher for the Premier League than you’d find if you extrapolated individual club averages from the Premier League’s own website. Sportingintelligence always sources information first hand where possible, and otherwise assesses other major providers of data, like ESPN, ITV, Transfermarkt, European Football Statistics and Worldfootball.net. There are differences between all of them, and each have apparent flaws, for example incomplete data in some cases, or ESPN’s divisional averages that don’t always tally with the figures you’d expect by taking ESPN’s own club-by-club data and doing the maths. However, most of the numbers are in the same “ball park”, within a per cent or so, although the La Liga numbers vary as much as four per cent between sources. We believe this is down to imprecise recording of data at source in Spain. We have found the worldfootball.net numbers to reflect, in most cases, the closest “median” of all the other sources.